Once a wi-fi network has been joined in OS X, the Mac will default to joining that network if it’s within range and available again. This is undeniably convenient for joining our home, work, and regular wireless networks, but it can be a nuisance when the Mac rejoins a network that you no longer want to connect to. 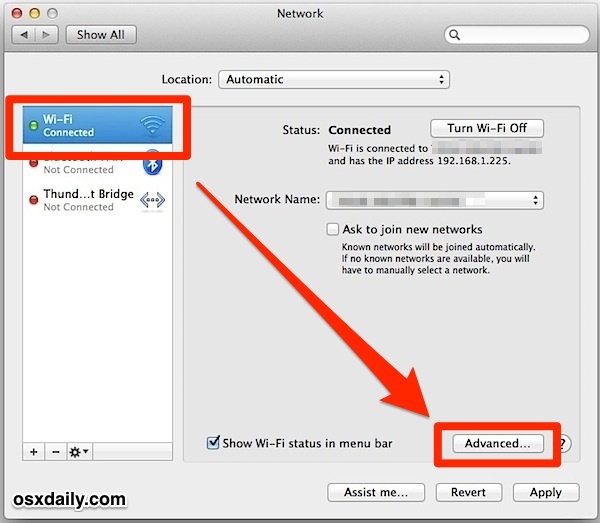 While setting the wi-fi network priority is one option, another option is to have the Mac “forget” the network, preventing it from automatically rejoining again. This is particularly helpful if you live or work within an area that has open networks available that you do not accidentally want to join. 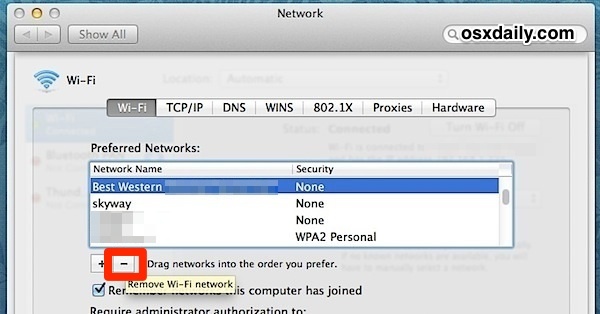 Forgetting a wi-fi network in Mac OS X is very easy, though the option is a bit more hidden than some users may expect. Fortunately, like the iOS counterpart, learn to drop a network once and you won’t have to wonder how to do it again in the future. This will forget the chosen wi-fi network(s), preventing the Mac from automatically joining it again when within range. Once a wireless network has been forgotten, OS X will no longer join it automatically – even if it is the only network available. If you change your mind, the forgotten network(s) can be re-joined or remembered again simply by choosing it from the wi-fi menu bar selection. This is worthwhile to use for dropping public networks without wi-fi encryption, forcibly forgetting a dual-band router channel that has a flaky connection, and it’s also handy for when a bandwidth hungry Mac continuously joins an iPhone HotSpot that has a limited data plan just because it’s located nearby. Though it’s fairly simple, being several layers behind preference panels has made this less-than-obvious approach to forgetting wireless networks a fairly common complaint from Windows users who have recently switched to the Mac platform. An easy way to prevent that confusion would be to add a menu bar option to drop networks from anywhere, but for now all versions of OS X work as described above.